"It was an incredible experience," the officer said. "Especially to see [the girl's] look when I explained." A Fairfax County police officer has taken our hearts into custody by helping a Woodson High School student with a very official promposal. Lauren wasn’t clued in when Lt. Doyle knocked on her door early in the morning, saying a suspicious teenager had been spotted in her yard. Lauren stepped outside to see who was hanging around. She was very surprised, Fairfax police said on Facebook, when her boyfriend, Grant, stepped out of a police car. He wasn’t escaping from capture, though; he was holding flowers and a sign with an important question. While we enjoy keeping the community safe, we also love playing matchmaker! 💘 A Woodson High School student created a ruse to ask his girlfriend to prom. • Lieutenant Doyle knocked on Lauren’s door early in the morning, alerting her of a suspicious teenager who was seen in her yard. Lt. Doyle asked her to come outside to see if she could identify him. She was taken by surprise when Grant got out of the police car with flowers and a sign, asking her to prom! Of course, she said yes. • We hope everyone has a safe and fun prom night! She said yes, police said. "It was an incredible experience especially to see Lauren’s look when I explained why I was at the house to when she saw Grant step out of the police car," Doyle said in an email. 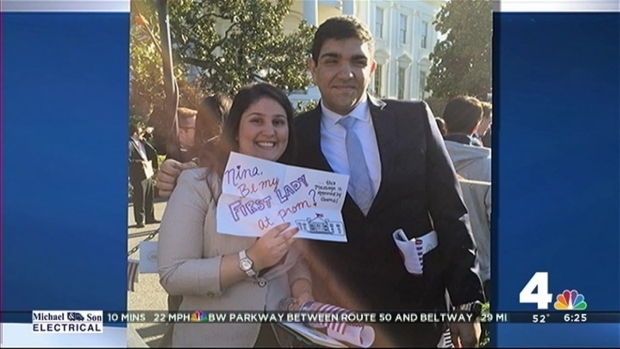 Now THIS is a promposal: A Loudoun County student took advantage of a trip to the White House to ask a date to prom. And the first family weighed in! Doyle told News4 that he met Grant's father years ago, and Grant's dad reached out because his son wanted to make his prom request special. "Grant planned the event out by coordinating the date and time with Lauren’s parents while we developed the ruse together," Doyle said. Doyle gladly went above and beyond his typical police duties for the community. "This area is blessed with great community members who truly appreciate their law enforcement officers," he wrote. "I, along with the rest of law enforcement, greatly appreciate all the support from them."